Websense Cloud Security is a cloud based proxy server which filters HTTP/HTTPS traffic and protects networks against malware, inappropriate content, torrenting, etc. It also allows you to setup quotas for browsing sites such as Facebook/YouTube and has a reporting feature to see who is looking at what. With the endpoint installed I have found that you can have more accurate reporting then the on premise server. I will go through how I set up the Triton cloud portal and deployed the endpoint. The directory synchronisation tools allows you to sync the on premise active directory users and groups. 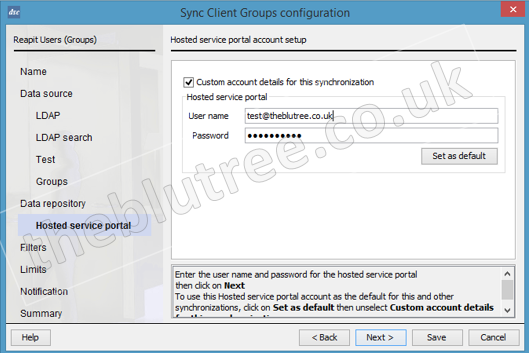 Download and install the relevant sync client for your operating system from account > directory synchronisation > download directory synchronisation client. You need to create a contact that has access to the Websense directory for the synchronisation. I recommend you create a new account that only has access to the directory and not a Websense admin. To create a contact select Account > Contacts > Add. Enter the relevant information about the contact account (The username should be an email address). Once the account has been created select the username to assign permissions. Enter a password for the account and select directory synchronisation. Next create the required Active Directory groups for each office/department and assign the relevant users to each group. You will be able to assign different Websense filtering options for each group you create. 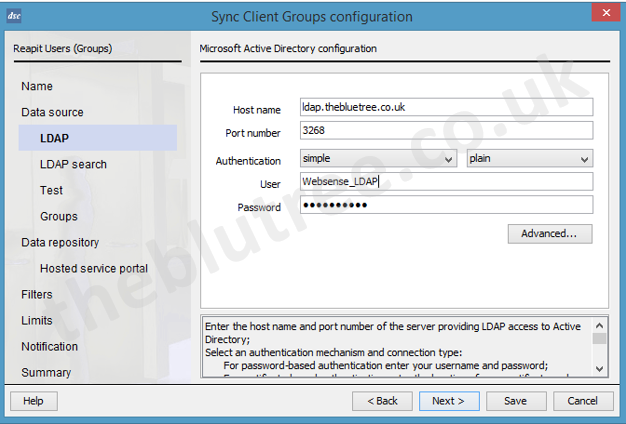 Once the group has been created you will need to use the directory sync client (DSC) to sync the users and groups up to Websense. Run the directory sync client select file new. Assign a name and select group for the configuration. Enter the host name for you domain, the LDAP port number and a user that has access to read the local AD. Select Next. This will bring up all the groups in the OU selected on the previous screen. Select Next. 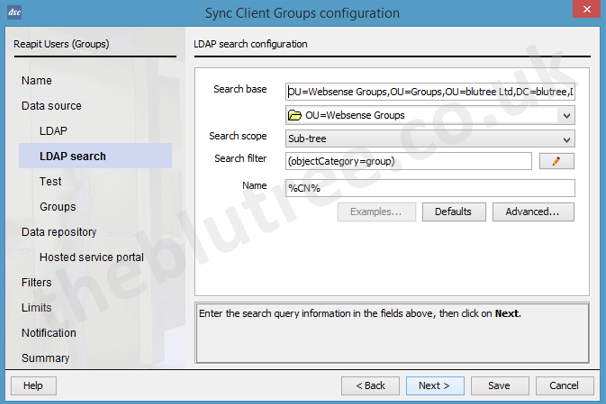 If you did not put the Websense groups in a separate OU you can use the group select to select just the groups you want to sync up. Select the repository type as portal. Click Next. Enter the details of the contact you created in Websense. Click Next. If you want to add any AD filters you can add them here. I just clicked Next. For the threshold limits I left them all un-ticked and clicked Next. Enter your SMTP details. You can select the email notifications you want to receive. I selected summary and log (info). This will send you an email every time the sync completes. Click Next and select Save. 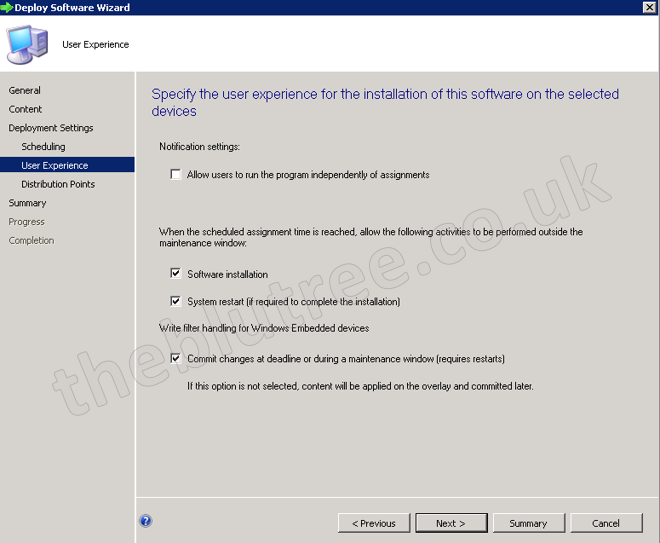 Once saved you need to modify the settings and select the configuration type as users and run through the wizard again entering the same details as before but selecting the users OU in AD. Once complete you select verify to make sure it works. You can also schedule the sync to run automatically. Log into the Triton web portal and select Web > Policies > Add Give the policy a name and provide an email address for the policy. If you have offices across time zones then you can leave the setting as the default which is to use the connection time zone. If you want to block explicit thumbnails and images in the search results for search engines (recommended) then you need to enable the setting enable search filtering at the bottom of the page. You can also set the quota limits here. By default it is set to an hour so if you want to create a policy for staff to be able to access certain sites such as Facebook only during the lunch hour then you can leave the default of 60 minutes or change to your preference. Once the policy is created you need to configure the policy to need your needs. If you have multiple sites then you need to decide whether you want a different policy per site. I don’t recommend this as maintaining multiple policies will become a pain if you have to make a change then you have to duplicate the change for each policy. Instead the best practice is to create a standard policy for everyone then create exceptions for the different sites using Active Directory groups. That way if you have to make changes to exceptions (non-proxied locations) you just need to make the change once. The next section under the connections tab is non proxied locations. This is for domains\IP’s that will not be filtered. I recommend adding the following domains to the non proxied locations as I have found issues when using applications such as office 365, WebEx, go to meeting etc. through Websense. I strongly recommend rolling out the endpoint (discussed later on) to all machines that will be filtered as it allows more accurate reporting and even if users have local admin rights they can’t uninstall the endpoint without the password you set in the portal. If you are using the endpoint I recommend the settings below as they won’t require to enter their credentials to connect to the proxy server. Instead it will use their windows credentials. 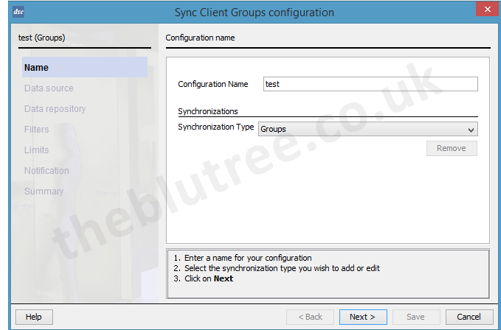 Under the directory synchronisation you need to assign the groups that will be assigned to this default policy. I assigned all the groups that were synched up to Websense and then you can customise each AD group on the next tab. Create a standard set of rules that will apply to everyone then create exceptions for any AD group that is different from the standard set of rules. This will vary greatly from company to company so I won’t go into much detail here but will look at creating a separate blog for the web categories tab. If you want to decrypt SSL traffic and you have rolled out the root certificate then you can select which categories to decrypt here. Under Account > Bypass settings you can enter domains/URLS to bypass authentication settings. I recommend the following if you use these applications. Once everything is setup you can deploy the endpoint. You can deploy manually, Group Policy or SCCM. I will show you the manual deployment and SCCM 2012 as that is what I used. Once the endpoint has been downloaded extract the contents of the Zip into a folder on the machine. WSCONTEXT=a67df7abc9ed6gf7abc6ed6gdf7abc9-0 = GPO taken from you Websense account above. 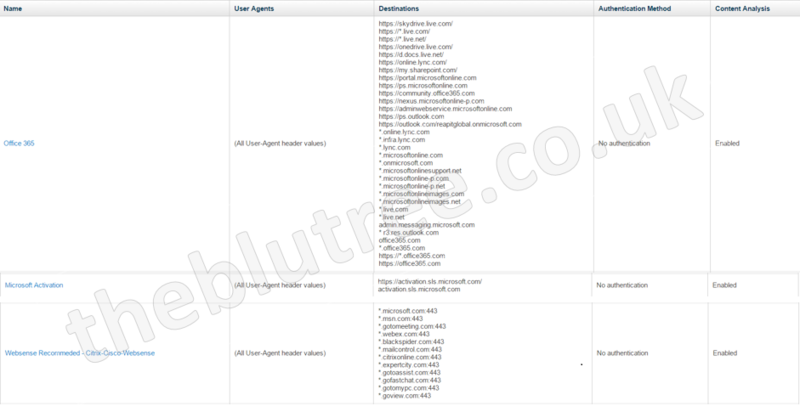 Once installed you will see the Websense icon in the system tray and you can test your policy. Once you have tested the manually deployment and it works as you expected you can deploy to the company. 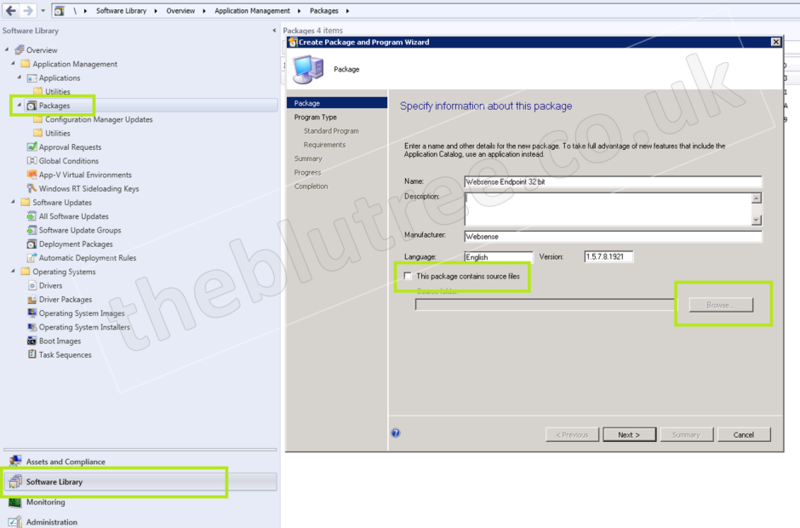 You can use System Center Configuration Manager 2012 to deploy the endpoint to the relevant machines. 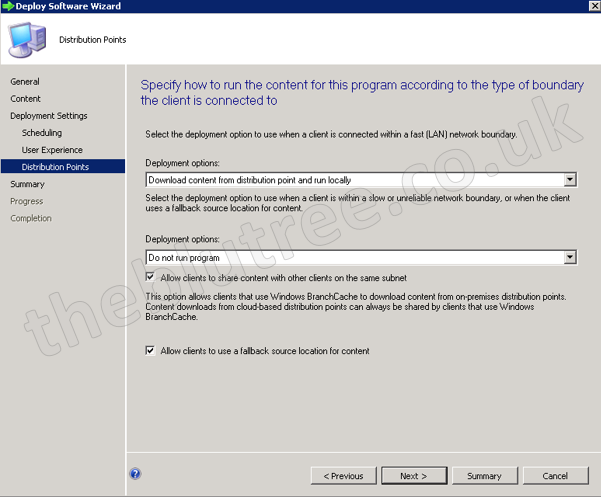 Create a share on the SCCM server and place the extracted files for the endpoint in the shared location. 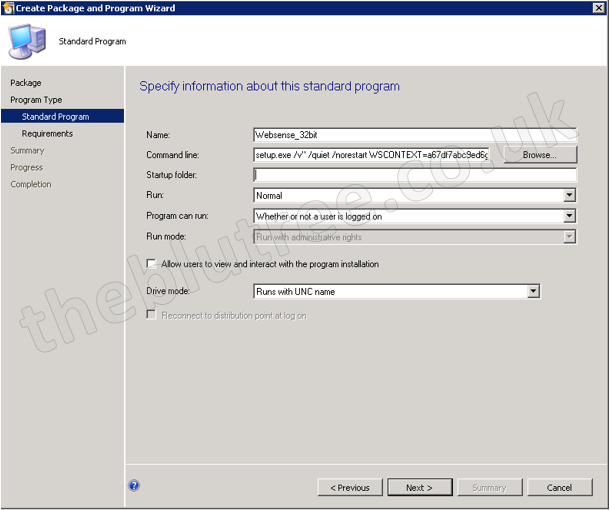 In SCCM select Software Library > right click packages > Create Package > enter the endpoint details and browse to the shared location where the setup.exe is located. Click Next > select Standard program > Next > Select the options below and place you GPO in the command window. Click Next and select the operating systems you want to deploy too. Then select Next > Next > Close. Select Deploy > select the collection you wish to deploy too > click Next > set the purpose as required > Select the settings below to deploy Websense straight away or select the options you require. Websense will now be installed for the relevant collection and will install automatically during the next sync of the SCCM client with the server or when new devices are added to the collection.